General Rubber is dedicated to providing technical sales and support to original equipment manufacturers around the world. Our highly experienced team of engineers and technical sales professionals work directly with the manufacturer to provide unique, value-added solutions, ranging from the simple to the simply amazing. We provide solutions specific for incorporating our OEM customers’ equipment into the overall system for improved performance and reliability. This includes utilizing Best Piping Practices and Optimization for systems with load limitations on piping and equipment. It may also include custom maintenance programs utilizing our Plant Reliability and Efficiency Program. Our solutions are engineered to meet your specific performance and cost objectives through a collaborative approach. Working as an extension of your engineering and marketing department allows General Rubber to deliver unique solutions that differentiate you in the markets you serve. Our process includes knowledge sharing, design expertise, materials development, modeling and simulations, prototyping, and transparent approach. Solving industries’ most difficult challenges: You have critical requirements, we have creative solutions! Provide unique solutions that improve equipment reliability, optimize energy use, and reduce energy consumption. Developing custom products for highly specialized equipment with focus on accuracy, repeatability, and ease of use. Creating solutions designed to optimize process reliability, increase equipment up-time, and lower total operating costs through our performance products. Creating solutions for high pressures and temperatures as well as harsh or aggressive media that allow you to meet your performance objectives. Delivering proven solutions that meet or exceed regulatory, performance, and safety standards. 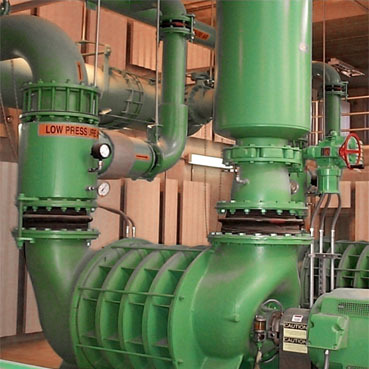 Our performance products are commonly paired with blowers, condensers, and other industrial equipment. General Rubber is proud to work with original equipment manufacturers to provide integrated solutions. We welcome you to contact us for more information.